For 2 players, aged 8 to adult. 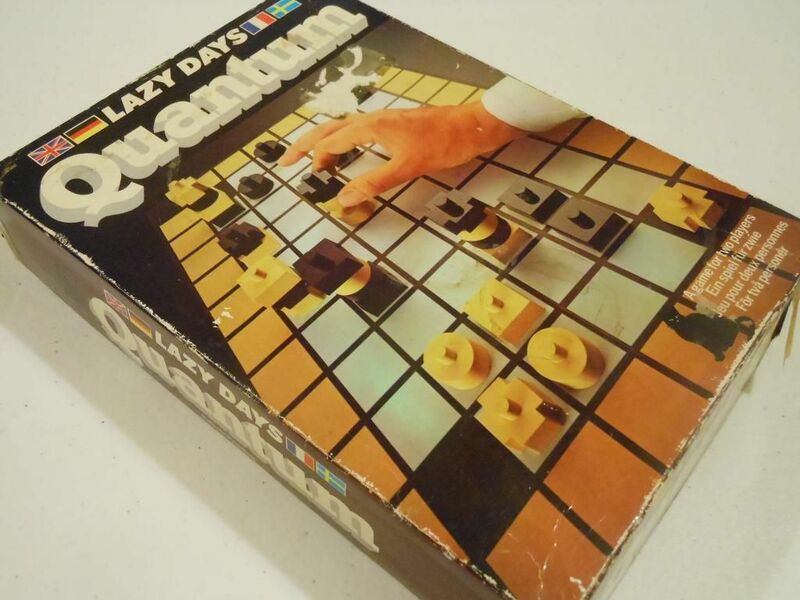 Quantum is a two-player strategy game that was released by Lazy Days in 1975. Even if you didn't know it was made in the 70s, the components are a bit of a giveaway: I don't think I have ever seen so much beige in a board game before. Honestly, I have never seen such a boring-looking game in all my life. It is like the publisher was striving too hard to make the game look serious and sophisticated (perhaps in an attempt to be the new Chess) and in the process forgot to make the game look fun as well. 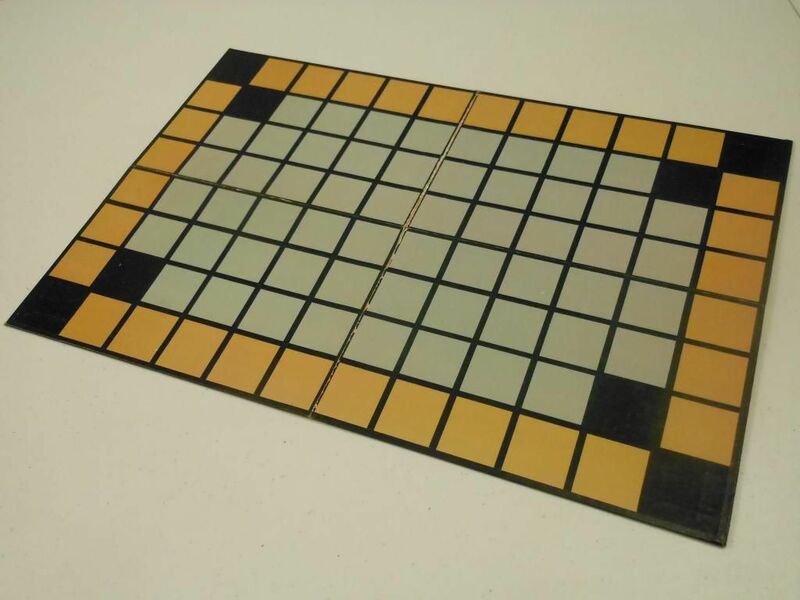 The actual board is a grid with spaces "coloured" in black, white, or beige, and the playing pieces are also black and beige. It looks hideous. And then they go and make matters worse by designing box art which just shows a disembodied hand moving aforementioned beige and black pieces around the beige and black board. It's one of the most lacklustre efforts to get someone interested in a game ever. There was no expense spared on the board art. Funnily enough, it was the bland box that first drew my attention to this game as I was walking through a car boot sale. The game looked so dreadful I had to buy it, even though the box was bashed all to hell and it looked like the game had certainly seen better (lazy) days. Luckily, apart from the damage to the box, and some serious wear on the folds of the board, the game wasn't in bad condition, and it was also complete. It didn't look interesting, but at least it looked playable. The game itself, as already mentioned, is a two-player strategy affair along the lines of something like Chess or Drafts. Each player gets a set of plastic playing pieces (six shaped like squares, six shaped like circles, and four shaped like crosses). Apart from the boring colours, these pieces are actually quite nice. They are chunky, easy to handle, and can be stacked on top of each other (more on that later). Both players set up their pieces on the board following a diagram in the rules. For short games, only the white inner section of the board is used; but for longer games, the whole board is used, including the delightful beige area around the edge. On his turn, a player can move one of his pieces one space. Square pieces move orthogonally, circles move diagonally, and crosses are the strongest pieces and can move in any direction. Much like in Chess, if you move one of your pieces onto a space containing an enemy piece, then you capture that piece; but this is where it gets clever: rather than removing the enemy piece from play, your piece is stacked on top of the enemy piece to form a tower. 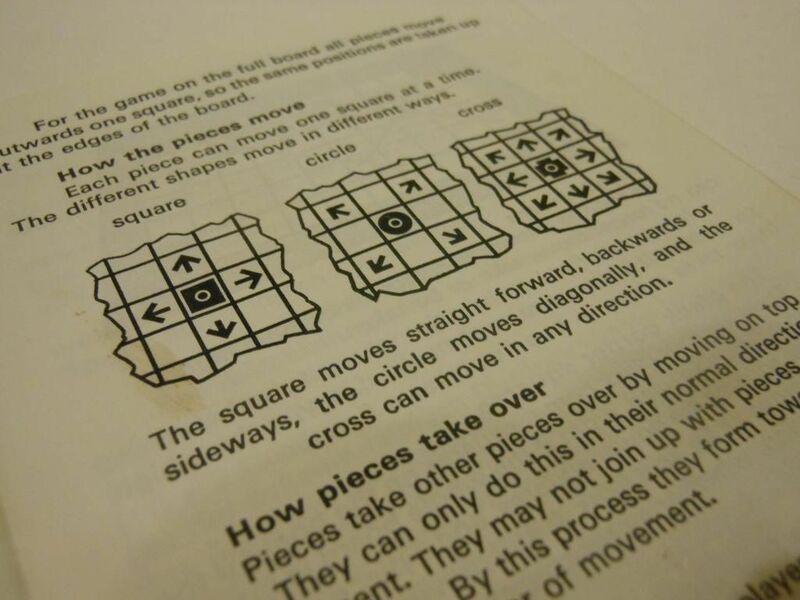 Rules - showing the movement of the playing pieces. A towers belongs to the player who owns the topmost piece, and moves in the same direction as the topmost piece (so, if a circle was at the top of the tower, then the tower would move diagonally, even if there were square pieces lower down). However, the taller the tower is, the more powerful it becomes, as instead of moving just one space, a tower can move a number of spaces equal to the number of pieces in the tower. This creates a really interesting dynamic to the game: You may see an opportunity to capture one of your opponent's pieces, but you need to make sure that this doesn't open up your piece to a counterattack. There is no point capturing an opponent's piece on your turn, if your opponent is then immediately able to recapture the tower, as all you have down is gift him a much more powerful playing piece. Similarly, even though towers are strong and enable you to move around the board quickly, you have to be careful not to put them in dangerous situations, as if your opponent can capture your tower, he will have an even stronger piece to use against you. There is also another rule to consider: Fixed towers. At any point a tower has six or more pieces in it, it becomes fixed in place. It can no longer be used, and it blocks the space it is on for the rest of the game. This means you may not want to use your four-high tower to take out your opponent's two-high tower, because in doing so you will lose your powerful tower while only taking out one of his weak towers in the process. While creating a fixed tower may lose you a powerful piece, sometimes it has to be done, as the only way to win the game is to be the first player to create three fixed towers. Knowing when to create a fixed tower (thus sacrificing your offensive abilities) and when to wait, is quite a skill, and can lead to much head-scratching. Combine this with the rule that any piece starting a turn on a black square can move as many spaces as you want (adhering to the piece's normal movement pattern), and you can see there is a lot to think about in this little game. 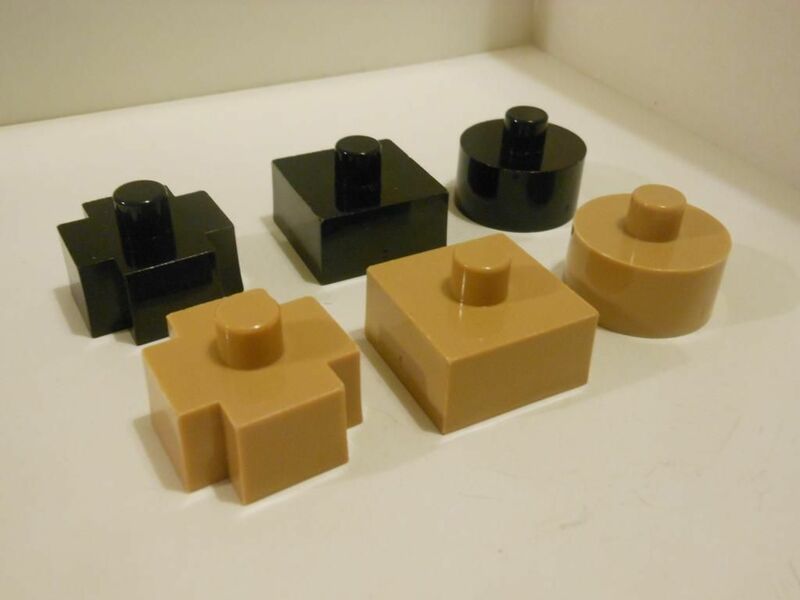 Nothing says "1975" like a nice set of beige playing pieces. You really do have to think hard about every piece you capture, and quite often you will see easy captures you shouldn't make because they would ultimately lead to your opponent having a strong tower to attack you with. It is also interesting that your strongest pieces are also your biggest liability: When you get tall towers, you will want to use them to crush your enemies, but you have to be careful, because if your opponent captures the tower then you will find your own pieces being used against you, or even worse, you will have gifted your opponent a fixed tower that will put him one step closer to victory. The risk of losing a high tower to your opponent, and the fact that in order to win (by creating fixed towers) you must actively remove your most powerful pieces from the game, prevents the high towers from completely dominating, and means that you always feel like the game is in the balance. It can get quite tense, and I have never seen a runaway victory. Overall, I think this is a great little game, with some cool mechanics that mean every game seems to go down to the wire. The rules fill three small sheets of paper in the rules book, and can be learned in just a few minutes; but this is one of those games that takes a long time to master. It's certainly far more interesting than it's box art, and the colour of the playing pieces, might suggest. If you can find a copy, give it a go. You might be surprised.